Day 22: Coyote Hills Memoirs – The San Francisco Bay Trail: It's Closer Than You Think! With the land of milk and honey behind me and getting smaller with every step, I found myself stepping back in time, four days to be exact. Beyond Charleston Slough, the San Francisco Bay and Highway 84 lay what, to the untrained eye, could be mistaken for a part of the Diablo range. However, to me it is still a vivid memory of a stunning example of the many unique, unexpected jewels that I have come across since May 31st. Highway 84 looms in the distance and is my tease for the day – the ending point at which I will call it a day and seek out the closest bus stop to take me to CalTrain. 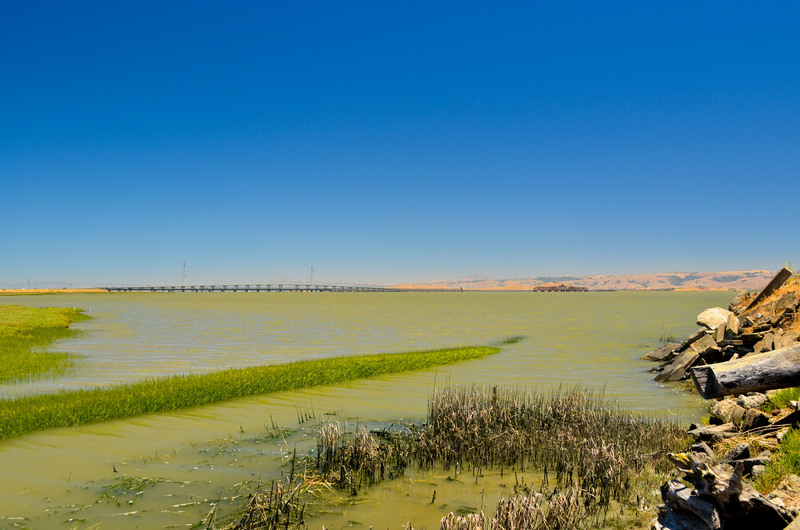 Yet with every gaze at Highway 84, I see the ecosystem that is Coyote Hills just beyond the Dumbarton Bridge. They remind me why I am out here and help me refocus on the moment. Gone is any notion of skipping a side section of Bay Trail for the sake of time or my aching feet. If I do that I will surely miss another gem. The options were there and they were tempting. I could have remained on the trail along East Bayshore, a short flat stretch of frontage road along Highway 101 or I could venture toward the water along the eastern edge of Palo Alto Baylands and still remain formally on the trail. When I reached that fork in the road my feet went right, not left, and my mind followed. My feet haven’t failed me yet, physically or mentally, and this time I thanked them for steering me in the right direction once again. Palo Alto Baylands Preserve is Palo Alto’s outdoor gym. The level of activity on a late Friday morning was impressive. Joggers, cyclists, walkers, they were all represented. I caught up to one walker and struck up a conversation. His name was Tony and he was a regular out here. We walked at a fifteen minute mile pace and stopped only once or twice to capture more images of white pelicans busy filling their bills with tasty morsels just below the water’s surface. He had his golden-doodle with him and he kept pace with us. It was nice holding a conversation with a complete stranger for nearly an hour. We talked about the trail and about the Sea Wolf building which we would be passing by. We talked about our dogs and our families. In fact we didn’t even catch each other’s names until we said our good byes and he headed back as I proceeded onward toward Ravenswood Open Space Preserve. Tony had ten years on me but kept a pace that had my knees protesting. He mentioned later that he is ex-military and his hiking pace was reflective of that. As I approached Bay Road where I would have turned left toward University to catch a SamTrans bus to CalTrain, I was greeted once again by Bay Trail expert Corrine Debra. There would be no left turn at Bay Road and, promised with a ride to CalTrain, I followed Corrine to the end of the Bay Trail in Ravenswood and back to Cooley Landing. That was three miles I wasn’t counting on but am glad I did since both Bay Trail spurs take you to the water’s edge where any excess baggage on your mind gets carried away by the waves and wind. It was a nice way to part with today and look onward to tomorrow. I scanned my Clipper Card on the boarding platform in Menlo Park and took my seat on CalTrain for the trip back to San Francisco. This was made all the better in San Carlos when I was joined by Christine Dunn of SamTrans. Christine was intrigued by the trip I was on and I explained to her why I was out here, all the different transportation agencies I had utilized with my Clipper Card, and the highlights of my walk thus far. She was a pleasure to speak with and I am glad I had the chance to meet up with her. I’ll be wearing my new CalTrain T-Shirt tomorrow so look for it on the trail and join me for a mile or two if you’re out there!